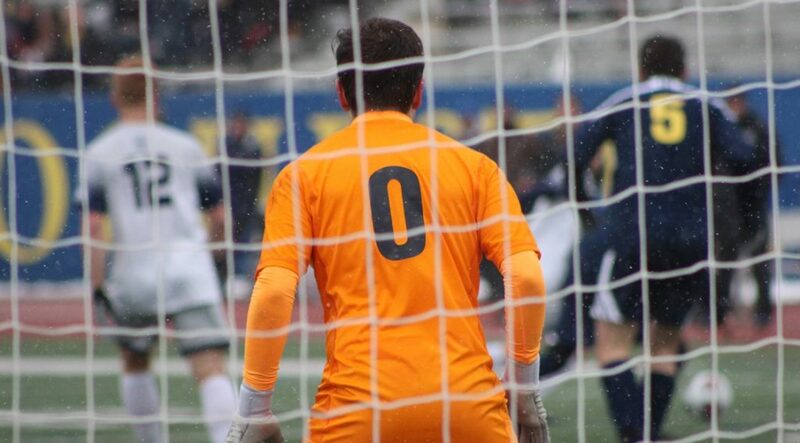 The University of Rochester men’s soccer team advanced to the Final Four for the first time in school history after posting a 2-1 victory over top-ranked Messiah College in the NCAA Division III Sectional Final on Sunday afternoon. This is the first time Rochester has beaten Messiah in the NCAA Division III playoffs. The Falcons won the first four meetings, including a 2-0 victory last year on their home field in Grantham, PA. That sent Messiah to the Final Four and the Falcons won the NCAA title. The 2018 sectional was supposed to return to Messiah, but a late-week snowstorm made the soccer field unplayable and the tournament was re-directed to Rochester on Thursday evening. Both teams attacked from the start and the first two goals – one each way – were examples of crisp passing and good finishing. The winning goal was an own goal and it came with just over eight minutes remaining. Rochester’s late lead pushed Messiah into full attack over the waning minutes and the Yellowjackets held firm. Messiah’s Nick West scored his 30th goal of the season, this one four minutes into the second half, to tie the score at 1-1. Trevor Gooding played a ball from right wing into the area to Brit Haseltine. He directed it to the left post and West was there to equalize from the edge of the crease. A full minute had not come off the stadium clock when West was denied a 2-1 lead. Conway came out to challenge. West shot the ball past him where it was blocked on the line by Will Eisold and cleared away. Rochester did its share of the attacking and produced a handful of chances. In the 13th minute, Bryce Ikeda collected the ball 10 yards outside the penalty area and fired just past the left post. The UR opening goal came when Patrice Douge won the ball on left wing and outstepped a Messiah defender down the left sideline. He put it into the middle and Ulrik Koren drove it into the net at 33:10. Conway denied West on the header deep in the crease. With less than four minutes left in the first half, West took the ball and ran 70 yards down the right sideline before cutting goalward and firing right at Conway. Apple’s pre-game strategy was simple: don’t look too far ahead and don’t get caught watching the clock. He didn’t want the Yellowjackets to get caught up in the moment – playing the defending champion and the nation’s top-ranked team. The Yellowjackets nearly broke the tie with 18 minutes left. They moved down the left flank, played the ball into the area, and then further to the right where it fell at the feet of Ryan Aspenleiter (Pittsford Mendon) at the penalty spot. His shot was just wide of the right post. Minutes later, Nate Leopold chipped it from left wing into the center of the goalmouth where Messiah goalkeeper Connor Bell punched it clear with UR jerseys populating the area. Rochester’s winning goal was a deflection. Cristian Baltier had the ball on right wing. He pushed it ahead where it was served into the area. Zach Lawlor (Aquinas) headed it into the middle. Connor Bell charged off the line with Rochester’s Aidan Miller in the center of the box looking for the header. Bell tried to punch it away, but the ball hit his hands and bounced haphazardly over the line into the open net. Notes: The Final Four will be played on November 30 and December 1 in Greensboro, NC. Rochester will play second-ranked Tufts University. The Jumbos defeated Montclair University, 4-0, in their sectional. The UR-Tufts game will be the second game of a doubleheader (1:45 pm EST). The first game will be played at 11 a.m. Calvin College, ranked No. 4 currently, defeated Case Western Reserve University, 3-1, to earn a spot…. Rochester’s record is 16-2-2 with the victory over Messiah (19-1-3).